Suitable for the disabled, wheelchairs and pushchairs. Rutland Water, owned by Anglian Water and the Leicestershire and Rutland Wildlife Trust, is the largest man-made lake in Europe situated in the county of Rutland. Rutland has now celebrated 14 years of independence as a county on its own. 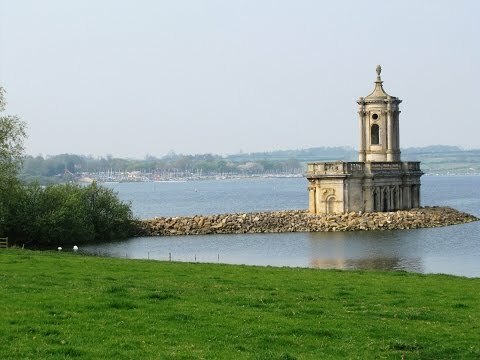 Rutland Water is a site of special scientific interest and this beautiful reservoir of 3100 acres was part of Leicestershire from 1974 until 1997. The circular track around the lake is 25 miles and is suitable for cyclists as well as walkers. There are also plenty of other activities such as lake cruises, Normanton Church and museum, Butterfly and Aquatic Centre, picnic and play areas, trout fishing, sailing and bird watching with 27 hides and is the site of the first breeding Ospreys in England for over 150 years making Rutland Water a great day out for people of all ages whether able or disabled. The village of Normanton and much of the parish was flooded in the 1970s when Rutland Water was created and all that remains now is the Normanton Park Hotel, few farms and cottages and Normanton church which sits on the edge of the water. Edith Western is a small village with a pub and nearby there is the cycle hire centre and the sailing club. Lyndon Visitors Centre and Nature Reserve, opened by Sir David Attenborough in 1985, is also home to the Osprey. The first Osprey chick to fledge here was hatched in 2001. The Ospreys, on the nest, can be viewed on the screens in the centre through live cameras and also from Waderscrape hide and Shallow water hide. In the Focus optical and Wildlife Trust shop at the Egleton Centre there is an environmental display, viewing gallery and a school service. The nature reserve at the western end of Rutland Water covers 600 acres and runs for 9 miles. Ospreys arrive here at Rutland Water from Africa in late March and April and leave again around August, September time. The Ospreys are faithful to each other and their nest. They re-use the same nest, called an eyrie made from branches and twigs, each year they will add to it until the nest becomes enormous. In late April the female will lay up to three eggs at 1-3 day intervals then each egg will hatch after 37 days. The pair share nest duties the female doing most of the incubating, brooding and direct feeding of the young while the male is the main fish provider for the female and the chicks. After fledging at 53 days the chicks will stay close to the nest for another two months with both parents supplying the food. Many of the young will die before their maturity age of 3 years those that survive will live for about 8 years. We set off from the car park at Sykes Lane Information Centre and turn left towards the dam at the head of the reservoir. We turn right onto the dam walk along the top, approx half a mile, until we come to the end then turn right and follow the track through a gate into a field and keep heading forward. We pass Normanton Park Hotel, open to non-residents and Normanton Church which is now a museum. We then head on to Edith Weston where there’s the cycle hire centre and the sailing club. We walk through the car park and pick up the track at the far side then keep following the track and paths through open spaces and woodland until we reach Lyndon Visitors Centre. We go inside the centre to view the Ospreys on the live screens and we are told the female is sat on two eggs. We then decide to purchase a ticket to go and view them from the hides. We stop off at Deep Water hide and Tufted Duck hide before we view the Ospreys at Waderscrape hide and Swallow Water hide. Both Ospreys are a long way off so it was difficult to get clear camera shots. After spending some time here we about turn, stop at the nearest picnic table for a break, then retrace our walk back the way we came to the car park at Sykes Lane. Very easy walking with good level tracks and paths which are suitable for wheelchairs and pushchairs. Sykes lane Information Centre at Rutland Water in Rutland. From the A1 take the A606 towards Oakham. Pass through Empingham then take the side road on the left, signposted Rutland Water, to the information centre and car park. There are public toilets with disabled facilities and ample car parking at all the centres around the reservoir. For refreshments there are kiosks at the centres, the Normanton Park Hotel and pubs in the villages situated around the edges of the reservoir.